Private Enterance and Bathroom and all come complete with all linens. After a hard day on the hill have a soak in our 10man outdoor hottub that is open during the winter months. For those mechanical issues you might incounter there is access to a heated shop or the Boulder Mt.Sled Shed is right next door. 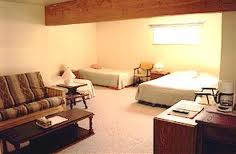 Stay and Play group rate which includes a full breakfast and a bagged lunch for up the hill. Sorry meals are offed from mid November to the end of April only!